people who have the mentality of a 2 year old. from Ain't it Cool News: "The trouble is the author was only 15 years old when he wrote it. that mirrors Star Wars or Lord of the Rings." And then the reviewer goes on to blatantly compare Eragon scene for scene with Star Wars. And he has a point! Eragon is a rip off from Star Wars, only it's set in a fantasy world. Which comes to my point: how mature do you have to be when you write? necessarily age) broadens your perspective and it comes out in your character development. more life experience than most 40 year olds. Another thing is: the more you read and write, the better you write. It's not enough just to read. You have to put it on paper and let the words flow, and you get better and better that way. 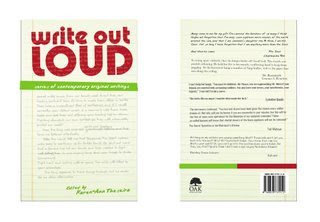 1) Ted, Yvonne and John have a new book launched today called Write Out Loud! Karen Ann Theseira IBook Project 1 and 2) is the editor and it's published by Oak Publications. Wish I could be there. But after said nasty abscess, now I have saliva leaking from my wound! Sigh. Anyway, not sure I want to present myself with half a paralyzed face just yet. Why is nerve recovery so slow? Anyway, congrats to all involved in this book!! Great success to you. 2) I now have 4 (maybe 6) stories for Dark City 2 out of about 10 or 12 I have received so far. A couple need to be reworked so I have sent them back to the writers concerned about rewrites. A writer to look out for is Jennifer Tai, who has a very easy style and prose which makes you want to go on reading to find out what happens next to her characters. For those who haven't yet submitted, keep them coming. If I think your story has potential, I will write back to you to suggest how you can make it better. As always, as those of you who have received mail from me know, I'm very constructive in my criticism. Congrats to Ted, Yvonne and John on their stories making into print. 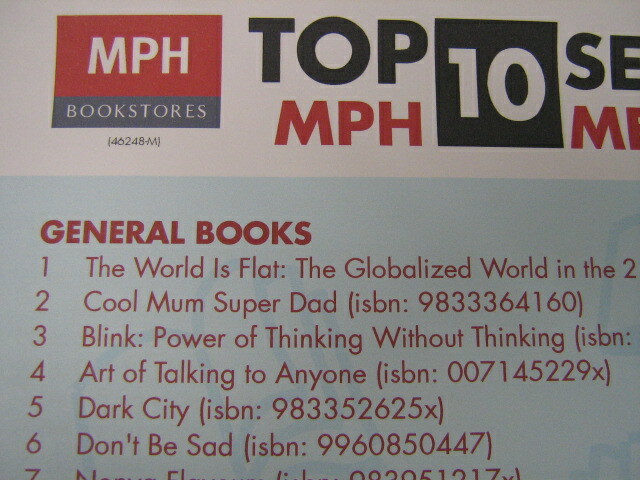 I've seen Jennifer Tai's name around somewhere - it it on WordUp or Nanowrimo, or somewhere else? I thought I've met this lady somewhere before, but I chanced upon a pix of hers and don't think it's the Jennifer I've met. the writer was merely 15. With practise, we become better writers. I can't bear to read what I've written many years ago, and to think I had the nerve to try submitting to short story contests. No wonder I didn't make the cut. But honestly, you can't fault the young writer. When I was his age, I was producing rip-offs as well from Sidney Sheldon (okay, so my reading material was a little more mature) and literary stories I liked. I now cringe to read what I wrote, especially in old school magazines. Isn't the editor of local game rag GameAxis called Jennifer Tai? In regards to maturity... I sometimes have this little voice inside me that keeps asking "am I mature enough to write this?" I have no idea if I'm mature enough... all I can do is to read widely and to write more, and hope I improve. Time will tell! Hal, looking forward to your next contribution. BTW, I'm also helping a Singaporean publisher friend collect some ghost/horror stories for the next anthology. Any you want to contribute? I went to Popular Ikano yesterday but couldn't find your book. Xeus, have put pen to paper for story 2 but other thoughts and fancies keep getting in the way. When is your targetted publication date? Ted, we're never too young to write or be published or to contribute our thoughts and feelings to the world. Now that I'm into my 40s (wow, it was hard writing that one down) I no longer have the nagging question of "am I young enough" but instead confront the issue of "is my writing good enough". Just saw this! Yea, I'd quit GameAxis Nov 2005. Can't believe it's been that long. I miss working. Miss playing games to cari makan! Anyway, thanks so much for the encouragement, Lynette. Now you've put me in a spot to write better. But, I work better under pressure! By the way, can I get your friend's email address, the one publishing the ghost stories anthology? Jenn, it's the same guy I gave you the email for...he's my agent. Did you receive it? His name is Jerry. I also gave him your email and he wants to contact you, particularly when I told him you illustrate as well.